Press restrictions in Libya make it difficult to get images out of the country. Many readers are wondering why CNN’s coverage of protests in Libya isn’t teeming with the photos, videos and first-person accounts that made our reports out of Tunisia and Egypt so riveting. The easy answer? They’re different animals. In Egypt, CNN was able to walk among the protesters and gather their stories (and even be attacked by them), but practical and legal restrictions in Libya make such open coverage impossible. With the exception of a handful of accounts out of Benghazi, CNN cannot immediately confirm most reports. The Libyan government maintains a firm grip on communications and has not responded to repeated CNN requests for access. We have interviewed numerous witnesses over the phone, but on Monday, it appeared that the country's internet connections and mobile phone networks had either slowed considerably or been shut down. We’re not the only media outlet experiencing difficulties. Jon Williams, BBC’s world news editor, wrote Sunday that Libya is one of the few countries where British nationals cannot operate without a visa, or obtain one on arrival. “There, the door is firmly shut to international journalists; local reporters face intimidation and the threat of worse,” he wrote. 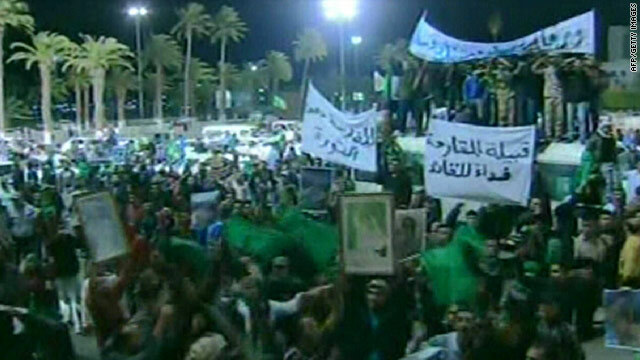 Libya is known for some of the world’s strictest limitations on the press. In its press freedom index, Reporters Without Borders ranks the nation 156th out of 175 countries. Though there has been some recent improvement in basic freedoms, the watchdog reported, “progress remains brittle." “The same goes for freedom of the press with the government making frequent gestures of openness over the past two years but pulling back from this progress lately. Moreover, it still exerts tight control over the media through a repressive legislative stranglehold." In January 2010, Libya began censoring the internet and blocked YouTube and independent opposition websites, the group said. It also has a regulatory body that monitors journalists who report on corruption. Responding to state actions targeting the press – including the November arrests of 22 of its reporters – Libya Press announced in December it was closing up shop in Tripoli and would resume its reporting from various foreign capitals, according to the Committee to Protect Journalists. Perhaps the ownership of Libya Press is telling, both to the degree of press restrictions and the level of societal tumult: The outlet is part of a media group owned by Saif al-Islam Gadhafi, leader Moammar Gadhafi’s son. Oh come on, all the other news organizations, BBC, Al Jazeera, Reuters, are there. the US never really needed to invade a country to get it to change. once the people have had enough and want it badly enough, change will come on its own. it will cost many people their lives, but no revolution is without its tragedies. CONFIRMED: Ghadafi has put the Major Military Generals under house arrest (ordered by Ghadafi himself) after their resignation. Col. Abu Bakr Younis Jaber, Col. Mustafa al-Kharroubi, Maj. Khoueldi al-Hmaidi are all in the support of the people. On the reception of the Lockerbie bomber in Libya, Kaddafi son words to the bomber read by a mouth movement expert were that his freedom was on the economical negotiations with UK. Next the bomber was received by father Kaddafi. Those actions convey to the Arabs the message that the terrorists are heroes.